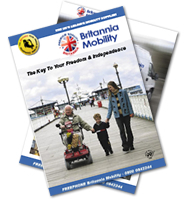 Britannia Mobility is one of the UK’s leading suppliers of mobility aids for outdoors and in the home. With our award winning customer service, and nationwide service and delivery, we specialise in helping our customers maintain their much valued freedom and independence. Britannia Mobility sells the widest range of mobility aids on the market today and we aim to recommend the right mobility solution at a price you can afford. Whether it's a new rise and recliner chair, a stairlift, a walk-in bath, a mobility scooter or an adjustable sleep system, Britannia Mobility can help you regain your much valued freedom and independence. Britannia Mobility offers the very latest in mobility aid technology with a simple goal of helping you lead a better life. For more information call us on FREEPHONE 0800 084 2244 or click here to contact us via e-mail. Please help us spread the word about http://www.loungeshopper.com by linking to us.